The ViaMichelin X980T stands out from the pack, in part because of the enormous 4.3-inch screen, but mainly because it looks more like a cross between a Nintendo DS and a paperback book than a boring old PDA. The dark grey casing carries six buttons, so we're talking about a large receiver; however, the quality of its feel and the chic dark styling belie that impression. This feeling of quality is reinforced when you slide the X980T on to the swivelling car mount with a precise and reassuring click. It seems that a hefty amount of money has been spent on factory tooling for this model. Plug in the power cord and connect the TMC antenna to the headphone jack and you're ready to roll. The TMC hardware is neat works well. It took a long time to lock on to three satellites, with a fourth appearing a moment later. Selecting a destination was nice and easy as the virtual keyboard is both large and intelligent. As you type in a town or road name, only valid next letters are displayed, while the rest are greyed out. It speeds up the process and the touch screen is fast and responsive. We found a quirk when we selected miles as the unit of distance, as directions were then displayed in yards, so it was 1,600 yards to the next junction, which is just weird. Surely we all think in metres or fractions of a mile, rather than yards these days. 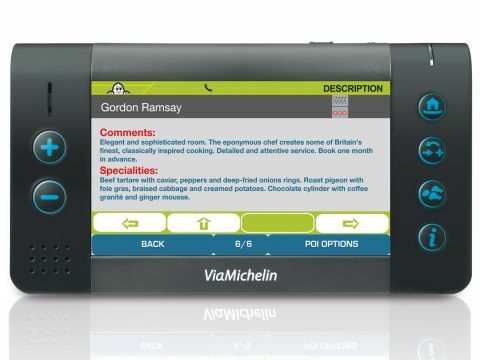 The real strength of this receiver is the POI search that lets you look up Michelin Guide restaurants and hotels, as well as loads of other places. You get impressively full details, including address, phone number and web address, and the search is based on the last GPS fix, even when you take the unit indoors; however, we noted one local shop was listed which moved premises many years ago. Despite the high price, the X980T is a clear award winner.